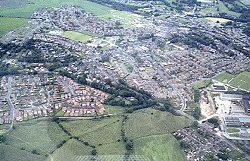 Welcome to the market town of Penistone and surrounding district in South Yorkshire. This is a family-friendly, personal website which explores my home town and the local area. I hope that you will find something of interest. JB. An iconic view of Penistone. The far hillside is ear-marked by Barnsley Council for a housing development. Tour Page - Reduced verbosity. Town Hall History - Some minor additions. Parade and Gala Weekend - June Events List. Free Video Software - Small updates. Tour Page - Zoom and Slide map added. PTC Elections - Table updated. BMBC Elections - Minor tidy-up. Info Panel - Moved down this page. PTC Election - Updated with full list of candidates. Free Video Software - BlackMagic Resolve 16, in Beta! History Timelines - Some minor additions and edits. Yorkshire Words - More added to the list. 21st Century History - Three new items. BMBC Elections - Nominations. Votes compared. A Sixties Extravaganza (Band concert) - Sat 27th, 7pm, Cawthorne Village Hall. Tickets £7.50, from Cawthorne PO or band members. Cawthorne Brass Band presents a concert with the sounds, tastes and memories of the 1960s. Quizzes, music, light refreshments (bring a bottle) and raffle. Prize for the best 1960s fancy dress outfit. 'Summer Holiday ' (Musical Film, 1963) - Sun, 28th, 2pm, Paramount Theatre. Tickets £6.50, Concessions £5.50 (stalls only) U15s and 60+. Much singing and dancing in Cliff Richard's classic road movie, as he accompanies Una Stubbs and friends across Europe in a double-decker bus, finishing in turmoil at Athens. The BBC were not involved with helicopter shots this time. The Box Office is open for bookings 10am to 2pm and during performances or call 76 7532, card sales accepted. (24-Hour Event Line 76 2004). Paramount (Facebook). Penistone Tractor Run - Sunday 28th April, Opens 9.30am, Carr Lane Farm, Gunthwaite, Nr Penistone, S36 7GB. Tractors arrive from 9am, for us all to admire before setting off 11am. It is not a race. They will pass through Penistone town centre at around noon to rapturous applause (as last year), and take a Pit Stop at High Lea Farm, Hoylandswaine. For a few hours from 2pm, they will trundle back to Carr Lane Farm to join the afternoon throng of family fun with a bar, barbecue and children's bouncy castle. For more information or to register your tractor (or stall? ), please call Sam on (mobile) 07729 054 301. Organised by Penistone Young Farmers. Proceeds to Barnsley Hospital's 'Tiny Hearts Appeal' in their new Neo-natal Unit. See Penistone Tractor Run on Facebook. Things to do for Bored Schoolies - Penistone Leisure Centre (aka 'Sporting Penistone') has a range of activities for the Easter school break, such as skating (£3 per skater each day), Segway Obstacle Course, Superhero Caricatures, Nerf Skirmish, Skating Lessons, Art Explosion and Quidditch too. Full details at PLC Easter Holidays. Public PAFD Meeting - Tues 30th, 7.30pm, Penistone Bowling Club. Organised by the Penistone Armed Forces Day (PAFD) committee (aka 'Penistone Raisers') and is open to all-comers, in the hope of gaining enough volunteers for the Big Day to be a rollicking success. They say: 'Come and join us for an informal chat. Be part of something amazing: Penistone Armed Forces Day, Sat 29th June 2019.' From Facebook. Leisure Centre Roof Fund - Penistone Leisure Centre (the old Drill hall) has had a good response but needs further funds to complete the essential roof repairs. See their 'Just Giving' link on the Great News page. See Pen LC. Church Roof Repairs - Penistone church is also in desperate need of roof repairs, such that the Remembrance Sunday service might not happen. The roof fund is via the Friends of Penistone Church, for which application forms are available in the church. Thousands of pounds are needed. The Penistone community will surely do its duty - just as soon as the fund-raising effort actually starts in earnest. Bring back the roof fund thermometer! Penistone Historic Archive - 10am to 1pm, Market Day (Thursdays), Lower Hall, Community Centre. Penistone History and Archive Group is always looking for old documents, Penistone Almanacks, family histories, local maps, memorabilia, photographs, slides, negatives, cine or video of local events and any other other history relevant to our district. These things are precious to our district. See the Penistone Archive website. Donations of all kinds welcome. History talks are on the first and third Weds of each month (except August) at Penistone Community Centre, for a small fee. Everyone is welcome. If you have some historic knowledge you would like to share, guest speakers are always welcome. For older people who would like to get out more, this is a good way to do that and discover local knowledge. PHG Enquiries to: Secretary Brian Robinson on (mobile) 07885 286 146. See Pen Archive Group (on Facebook). Keep it in Penistone - Barnsley museum would like to collect our local historical nick-nacks, which might be only displayed in rotation, if at all, and permanently lost to our district. It is better if our historical materials are instead kept in Penistone where we might all enjoy access to them, rather than lost, forgotten or disregarded in another, distant town. Please support Penistone Archive (Facebook), not Barnsley. Also see the PGS Archive (Facebook). Penistone Crime Reports (SY Police) - Action Fraud - YW Callback - UK Bank Holidays. Visitor Information - Penistone Library and Penistone Church for local leaflets, maps and general information. Penistone, Peak and Pennine Tourism Group - Promoting the local economy and tourism, PPP&TG. Penistone Shopping - See Penistone High Street (Visit Penistone), Love Penistone (Facebook). Penistone Market Day - Busy market Thursdays, Penistone Market Barn (FaceBook). Adjacent two-hour parking. Penistone Country Market - 10am to Noon, Market Day, Upper Hall, Community Centre, Church Street. Penistone Historic Archives - 10am to 1pm, Market Day, Lower Hall, Community Centre, Church Street. Banking Security Advice - 10am to noon, Market Day, Community Centre. Debbie from Natwest. Saturday Morning Market - Market Barn. Small market with Andy's good fruit & veg. (Email Market Services). Learner Zone - Monday 1pm to 3pm, IT suite, Penistone Library. A quiet space with internet for study, with support for job searches, job applications and interview skills. Also maths, English & IT assessments. (Facebook). 'DIAL' Drop-in Advice - 10am to 1pm, Thurs, Top Office (former Berneslai), Town Hall Bldg. No appointment needed. 'DIAL' is a charity to help disabled people, part-funded by Penistone Area Council (BMBC). Defibrillators - Clark's Chemist; Penistone Community Centre; Spring Vale Methodist Church; St Aidan's Church Oxspring; Whitby and Chandler Spring Vale; Penistone Leisure Centre; Millhouse Institute; Thurgoland Village Hall; the former shop in Ingbirchworth and a converted phone box in Upper Denby. Call 999 and give your location for an access code to open the box, then read the instructions inside the box. First Responders. Navbar BST clock gizmo uses internet time. The country gizmo was added 25th Feb 2009.